What do you get when you combine zesty sweet goodness with a thick, hearty texture? Besides awards (we’ve gotten those too), the result is the most popular of our barbecue sauce trio – our Mild sauce. Our family recipe manages to deliver big taste without fat or cholesterol, very few carbs and a minimal amount of sugar. With all-natural quality ingredients, it’s a year-round classic for outstanding recipes from your grill, oven and slow-cooker. (It’s even gained a following of fans who put it on eggs, fish sticks and bagels!) What do you put it on? Looking for a little kick in your sauce? Then our HOT Barbecue Sauce is the one for you! There’s no identity-crisis for this middle child of our gourmet Barbecue Sauces – it delivers the same award-winning taste and texture, spiced up with a pinch of heat. Too good to keep for your grilled favorites alone, try it mixed in pan fried potatoes, on burgers and dogs, and as the perfect spicy-sweet sauce for slow-baked ribs! But don’t stop there – send us your favorites! There’s one in every crowd . . . are you the person who wishes the barbecue sauce had some real heat? The one who is always asking for the bottle of hot sauce? We made this sauce for you. We've taken our award winning barbecue sauce and zapped it with the heat of cayenne peppers and finished it with a hint of sweet brown sugar. Pour it on all your favorites, but make sure you use it for unforgettable shrimp cocktail, firehouse chili and chicken wings that will make you the king or queen of football night! What do you put Richard’s HOTTEST on? "We have been enjoying your sauce for years. When we run out of it and buy other sauce, sooner or later during the meal my wife or I will say: "This is not as good as Richard's. Next time let's get 2 bottles." Boooring – If that’s what comes to mind when you think chicken, you’re in for a treat! 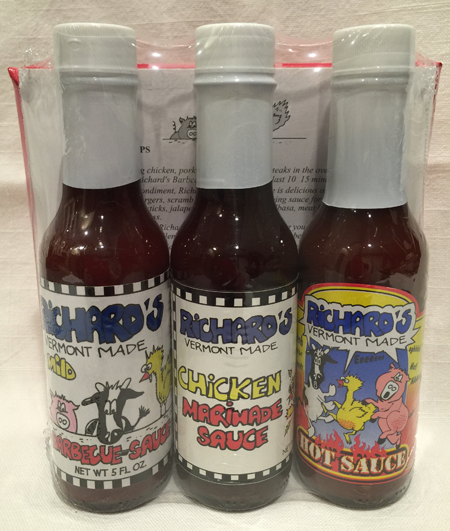 You'll love our newest addition to the Richard's Sauces family, easily recognized by the panic -stricken chicken on our label! It's an extraordinary gourmet chicken marinade that enhances flavor, adds moisture and tenderizes in a flash! Works great on the outdoor grill or even indoors on a "George Foreman style” grill. And, as always, it's all natural, very low in sugar, sodium and carbs, and has no cholesterol or fat! Made from the freshest quality ingredients, you'll find the flavor delicately delightful! Sports-men and -women, you asked for it! 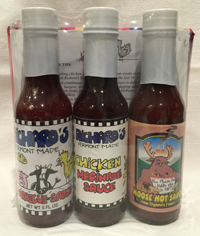 Richard's Game Sauce is the complete game marinade that seasons, tenderizes and takes any hint of gamey flavor out of venison, bear, duck and other game. The perfect blend of all natural ingredients, it's delicious not only on game, but on beef, pork, game birds and even salmon – giving leaner cuts the added moisture they need to melt in your mouth. And our customers tell us it makes a great beef jerky too! It's another Richard's family recipe stamped with the Vermont Seal of Quality -- all natural, very low in sugar and sodium, no fat, no cholesterol and low in carbohydrates. "Heat with flavor” is how a lot of folks like to describe our hot sauce. 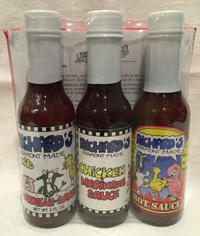 Unlike those run-of-the-mill hot sauces that are so busy being hot, that they forget about taste, Richard’s Hot Sauce delivers all the fire you’re looking for, without sacrificing a bit a flavor. All natural like the rest of our sauces, our hot sauce is simply the best on wings, ribs, chili, guacamole and even eggs! Available in 5 oz. and 18 oz. bottles. What do you put Richard’s Hot Sauce on?